Don't come here looking for New York–style pizza. This is Tony Gemingnani's paean to Napoli, complete with ten different kinds of pizza baked in seven different ovens, ranging in temperature from 550 to 1,000 degrees. Gemingnani has an impeccable pedigree: He's the first American to win the World Champion Pizza Maker title in Naples, and the sometimes epic wait for a table in this busy corner of North Beach attests to his star power. 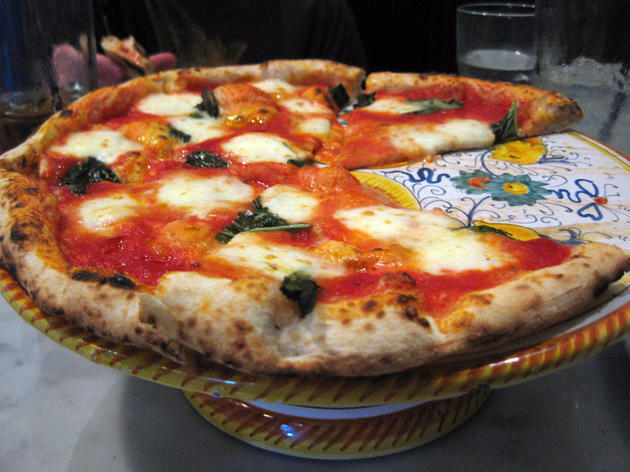 Heavenly Tomato Pie made with hand-crushed tomato sauce and cooked in a 1,000-degree coal-fired oven, and the award-winning Margherita, with handmade San Felice-flour dough and San Marzano tomatoes (limited to 73 per day)—are just the tip of menu. Among the other dizzying choices are Detroit and Sicilian styles, stromboli and calzone. Bus 8X, 8BX, 30, 39, 41,45, 91. I'm sorry Stuart M had a bad time at Tony's, but I can understand the issue with service as they are generally extremely busy at 6-7pm (expect a wait and take first available seating!). I can say after going four or five times that they have been consistently awesome to us. I love talking with the serving staff as we have gotten their wine sommelier (who recommended a great tuscan), Tony's wife (I think), and happy smiling faces dropping our pies off. It's worth the trip out to North Beach exclusively for them. The best part is the selection. My girlfriend doesn't care for their margherita, but loves their prosciutto and pear with a totally different crust and baking oven. 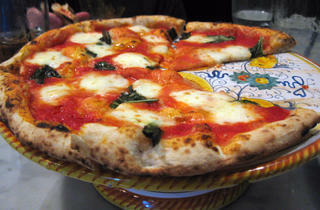 The various styles are great, but I'll always be ordering the classic margherita with a glass of red. The side of the box says 'Respect the Craft', but no mention of the customer! Order of 2 standard issue pizzas placed at 6.44pm, advised 20-30 minute wait - all good so far. At 30 minutes enquired about timing - one was out but 'waiting on the 2nd' - after 15 more minutes the second arrived, and that's when the counter staff got ugly. After asking if they could reheat the 1st that had been sitting out for more than 20 minutes and was now cold, a fit of histrionics by the staff led to the manager being called. To his credit he said he'd arrange a replacement immediately. 'A couple of minutes tops'. At 8.15pm the replacement arrived and the 2nd pizza was now stone cold. I asked about the cold pizza and again they said talk to the manager. What's the point - the cycle of one cold pizza would go forever. I simply said I would give a bad review. The hot pizza was ok, the cold though reheated at home was soggy and surprisingly burned to a crisp on the bottom, so had to binned as inedible. Complete fail Tony! Stop believing all the press and try some good customer service. No offer of a refund or discount or a simple apology - front of house staff complete fail. Perhaps it's endemic as there was a female customer crying when I arrived. Says it all really!